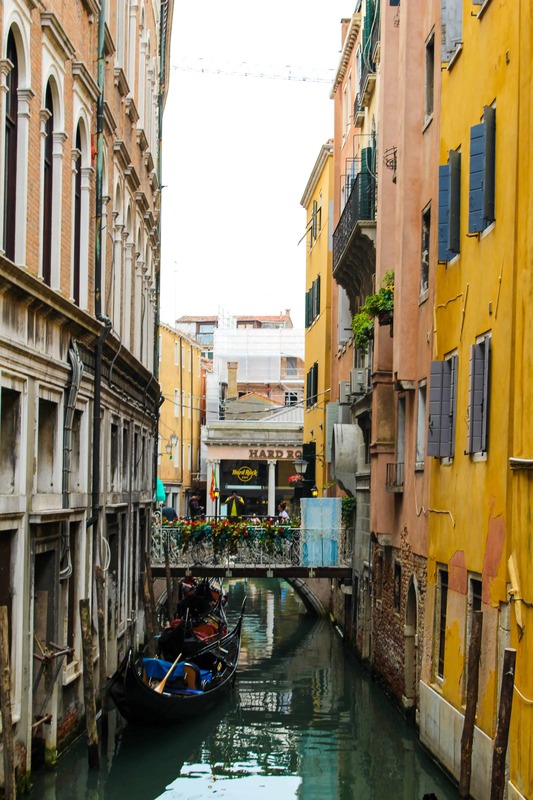 This travel guide for Venice Italy details how to spend 48 hours experiencing this magical city like a local. 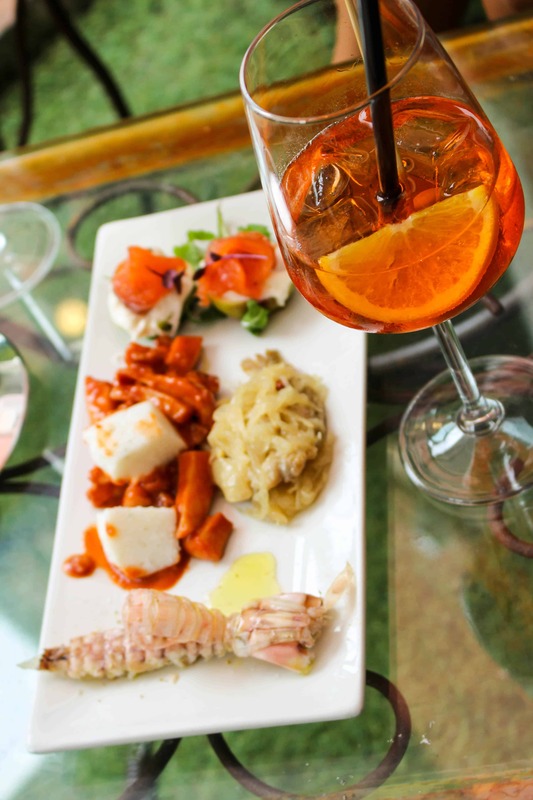 Cicchetti, wine, and plenty of seafood! Venice is a peculiar city. In many ways, it reminded me a lot of New Orleans: They’re both dirty, artsy, and sinking cities, famous for throwing lavish Carnival celebrations. 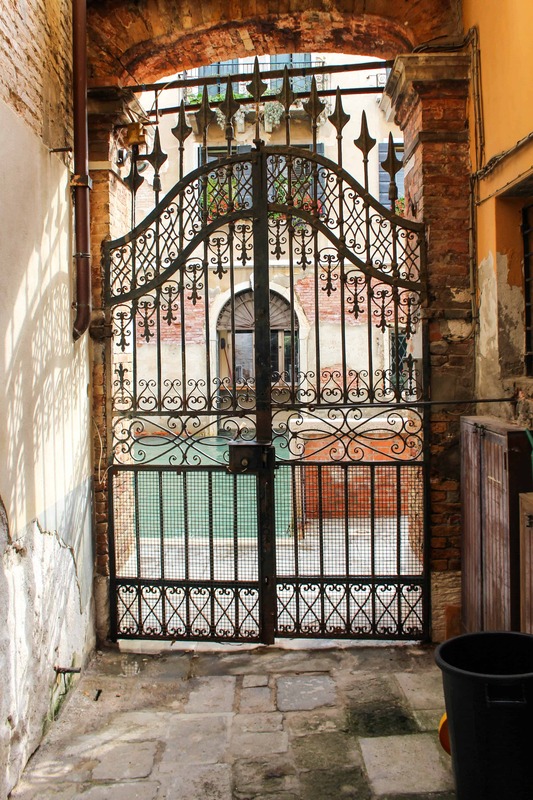 They’re each made up of old, narrow streets that overflow with characters and history. And both New Orleans and Venice are home to a unique, seafood-centric food culture that swept me off my feet. Trying to navigate Venice feels like being in a dream where you’re traveling through long, endless passageways that open up to random sights, open spaces, and dead ends. Things seem familiar, but nothing really makes sense, sort of in an Alice in Wonderland meets Wizard of Oz type of way. It feels as if you’re floating, because well, you kind of are. 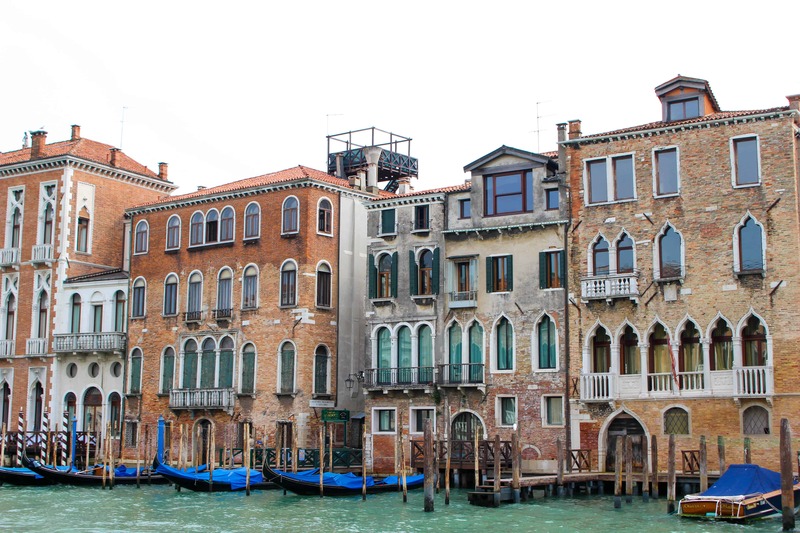 Venice is mysterious, enchanting and altogether difficult to wrap your head around. 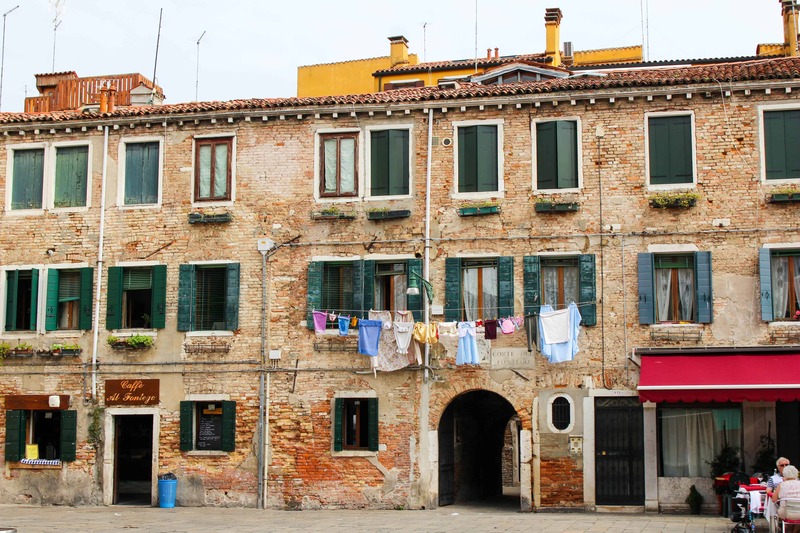 We rented a funky and spacious apartment through VRBO in the Dorsoduro section of town, which was situated in a building that dated back to the 1600’s. The decor evoked the same vibes as the rest of the city: surreal eccentricity with a touch of grit. It was cool, but we didn’t plan on spending a whole lot of time there. 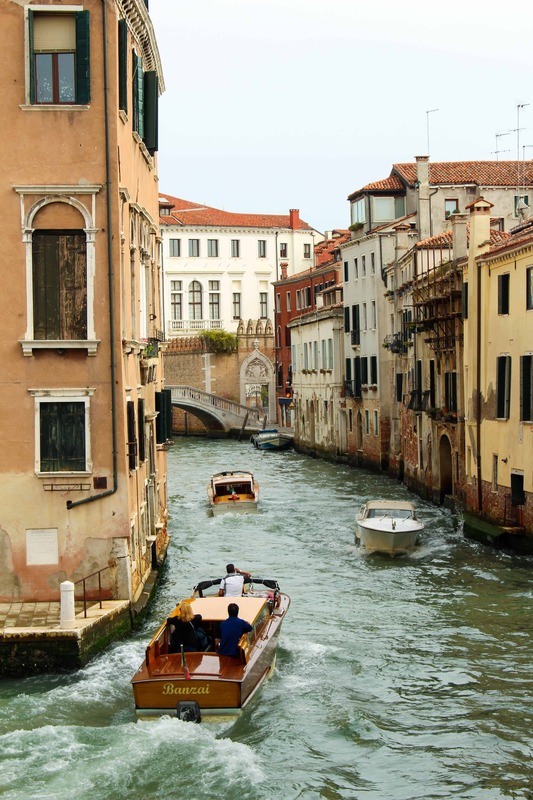 Venice is a city with far too many nooks and crannies to explore in just two days. We spent our first few hours just putzing around, attempting to get a lay of the land (pro tip: you can’t). We tried our best to keep track of our steps and any landmarks we passed, but Venice was built with the intention to confuse you. Eventually, we succumbed to the idea that getting lost was inevitable, so rather than worrying about it, we opted to have a cocktail instead. We found ourselves at a place that curiously calls itself “Corner Pub” and ordered two Aperol spritzes, a bitter orange liqueur and Prosecco libation we’d become very well acquainted with on our trip. We noticed the men behind the bar were starting to put out little plates of food on the counter. Each one consisted of thin slices of bread topped with all sorts of meats, cheeses and vegetables. I walked up to the bar and ordered an assortment, each costing about one Euro. They placed them briefly on a griddle to warm the bread, then delivered them to our high top where we devoured them in a matter of minutes. 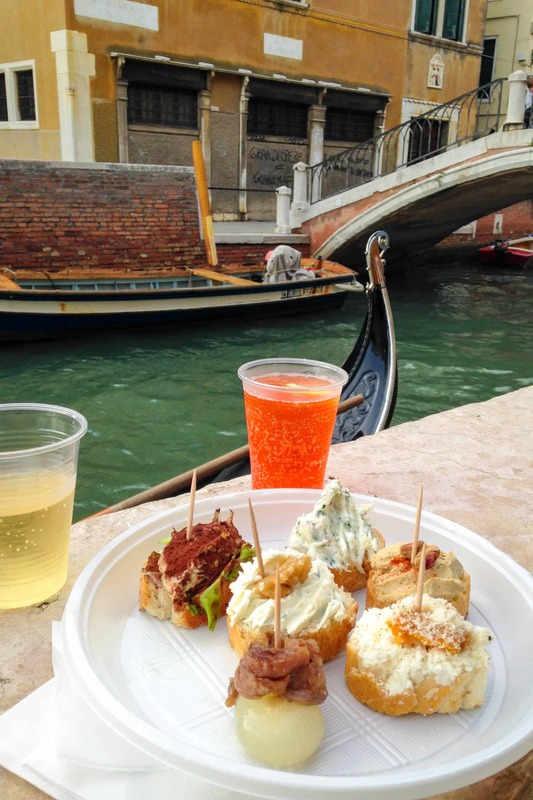 We had just discovered the delicious local treats known as cicchetti (chih-KET-ee), which is essentially Venice’s answer to Spanish tapas. Finding more cicchetti became an immediate obsession. We finished our drinks and kept wandering, poking our heads into bars to see what sort of goodies they were offering. We spent our evening meandering around, filling up on little glasses of wine and tasty morsels from a number of different places. Somehow – miraculously – we managed to find our way back to the apartment, where we fell fast into wine induced comas. The next morning we woke up feeling a little bit groggy, but that wasn’t about to stop us from exploring. We downed some espresso and snagged a few mediocre pastries from a nearby cafe, then took off towards the more touristy parts of town. We arrived at the Grand Canal and began making our way over the famous Rialto Bridge, which was so ungodly packed with people, I wanted to jump off into the filthy water below. 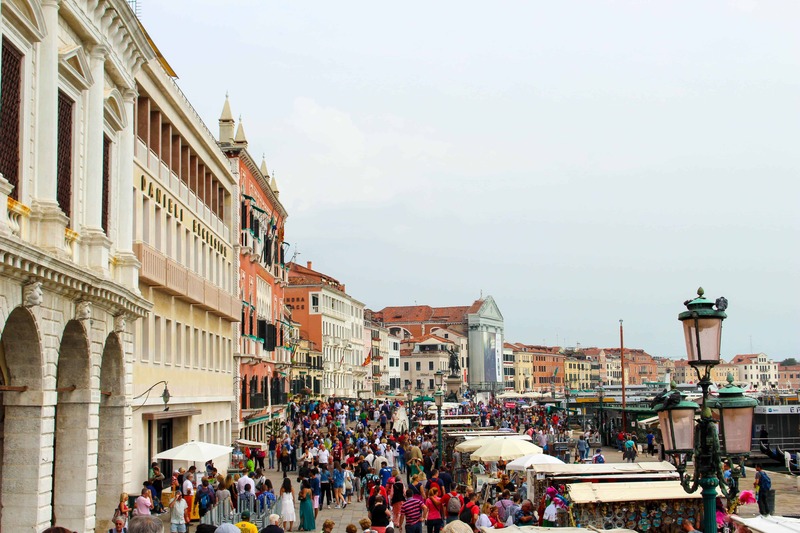 When we finally finished pushing through the tourists, we found ourselves at the Rialto Market, which was also very crowded, but we enjoyed browsing the provisions and even bought a few souvenirs. Breakfast left us wanting a little more, so we plopped ourselves down in the courtyard of Vinaria for a quick bite and a little hair of the dog. We ordered some drinks and an assortment of interesting seafood from the bar. It was just okay. We enjoyed a prawn-like crustacean in it’s shell and fresh figs topped with smoked salmon and burata. But the cuttlefish in tomato sauce with polenta and the sardines with onions just weren’t doing it for us. It was somewhat unsatisfying but filled our bellies enough to manage the crowds a little longer. After lunch, we walked to Piazza San Marco, which I can only describe as being like Disney World. Men in striped shirts were hawking ridiculously expensive gondola rides like cartoon characters, and vendors were everywhere selling cheap chotchkies for “GOOD PRICE!” Everyone in the vicinity was holding a selfie stick, feeding the pigeons, and looking around cluelessly for their tour group. 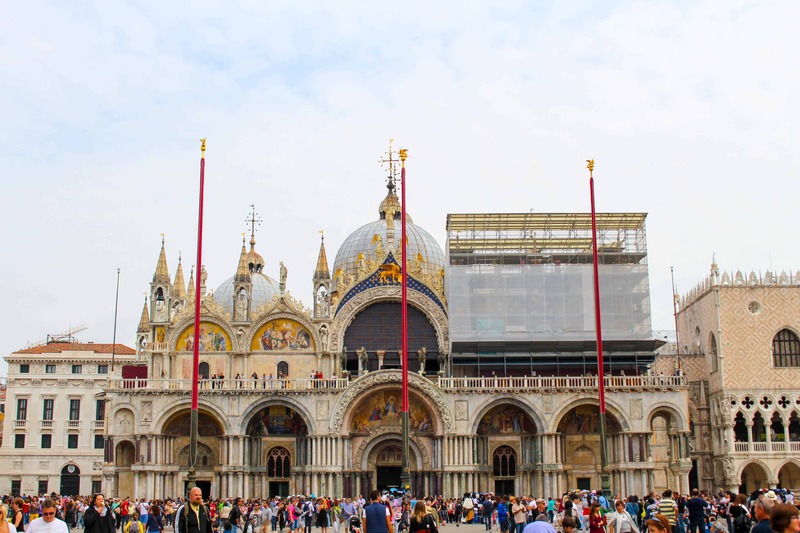 Due to the commercialism of it all, the Basilica and surrounding architecture felt fake. We kept having to remind ourselves that this is, in fact, the real thing, and it’s what places like the Venetian in Vegas are modeled to look like. Even still, it felt inauthentic, claustrophobic, and irritating. 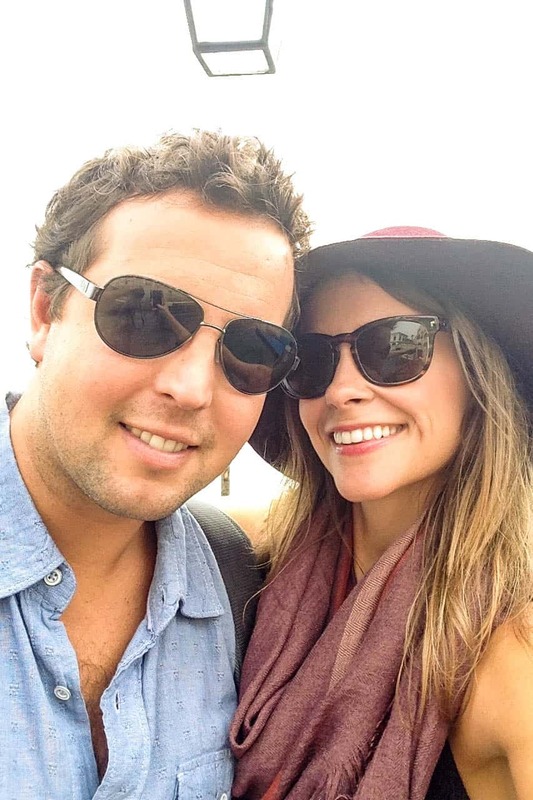 We took one look at each other and said “lets get the f out of here.” So we hopped on the first water taxi we found and cruised back to our ‘hood. 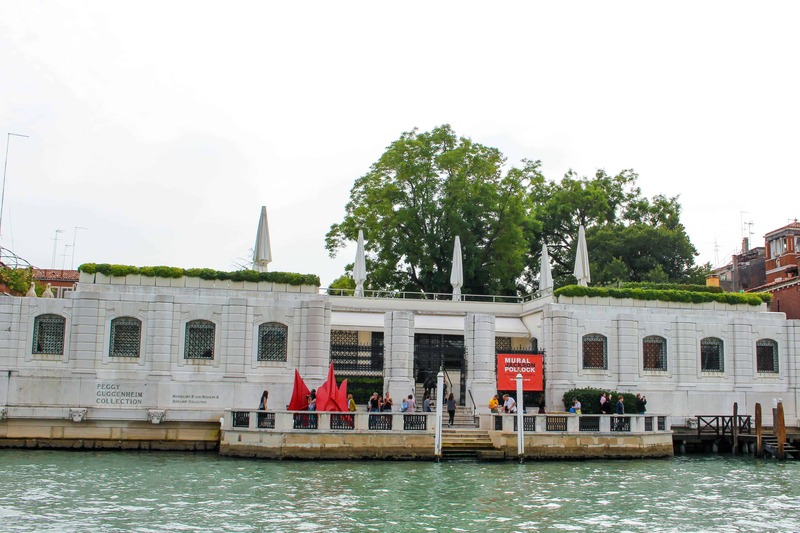 On our way back to Dorsoduro, we passed the Peggy Guggenheim museum, and instantly knew how we’d spend the rest of the afternoon. On our walk over, we saw some cicchetti calling our name from a window, so we stopped in for a glass of wine and a bite. Thin pieces of bread were topped with paper thin slices of coppa and hot peppers, and another with bacalao (salt cod) and giant caperberries. We gobbled them up, took our wine to go, and sipped as we waited in a short line to enter the museum. Once inside, we knew we had made the right move. While we certainly appreciated the Uffizi in Florence, this kind of art is simply more our speed: modernism, cubism, surrealism, etc. There just so happened to be a Jackson Pollack mural exhibit taking place, and it was absolutely incredible. The museum exists in what was actually Ms. Guggenheim’s former residence, and is home to what was once her very own personal collection. It took us a little over an hour to casually make our way through the collection, which was the perfect reset. We left feeling refreshed and back on the right track. But it was still only mid afternoon… Now what? More cichhetti, thats what. This was our last true night in Italy, and you’re damn right we were going to make it count. I was hell bent on going back to Cantinone Gia’ Schiavi, a super chill spot, with a unique take on cicchetti, that we’d discovered the evening prior. It hadn’t yet opened, so we wandered a little further down to Osteria al Squero for wine and snacks as we waited for the other wine and snacks. When Cantinone Gia’ Schiavi finally opened it’s doors, we were first in line to load up our plates with as many tasty little treats we could fit. 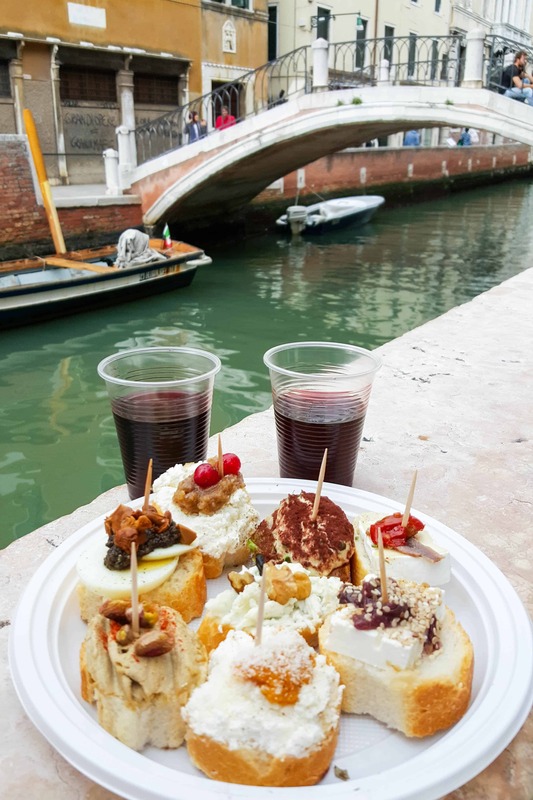 This place is small and crowded, so we followed the locals and went outside, perched up on the canal and people-watched as we savored each and every morsel. Some of the most notable and interesting combinations we tried were: A rich and savory pistachio mousse; fresh ricotta with pumpkin puree and parmesan; whipped gorgonzola with walnut; fresh goat cheese with aged balsamic; hard boiled egg with mushrooms and truffle pate; a brie like cheese with anchovy and dried tomato; ricotta with walnut jam and fresh currants; and quite possibly the most unique combination of all: tunafish topped with cocoa powder. Oddly, it worked! Each one was about 1.25 Euros, and after we finished, we went back in for more. 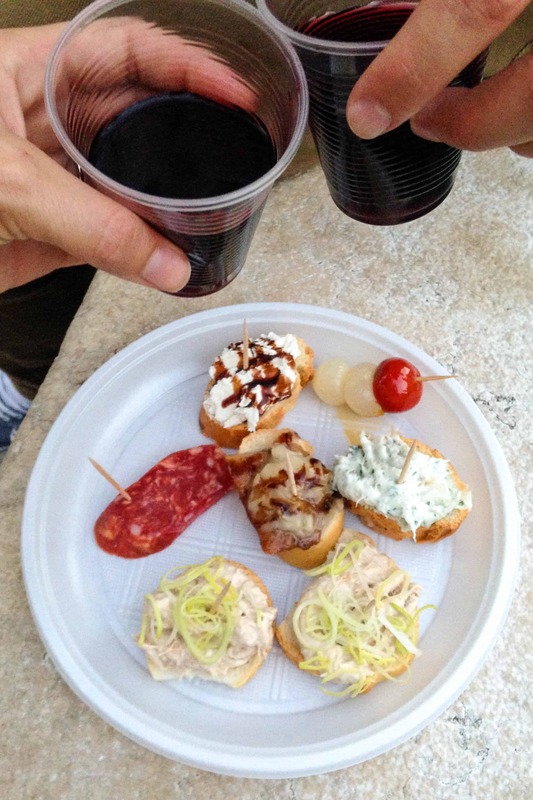 We continued to cicchetti hop, plastic cups of wine in hand, and found our way into a less crowded, slightly more upscale spot called el Sbarlefo that had yet another interesting selection of nibbles. We nibbled on marinated white anchovies, some olives, mozzarella wrapped in prosciutto, tuna stuffed cherry peppers, and sipped better red wine out of more respectable glasses. 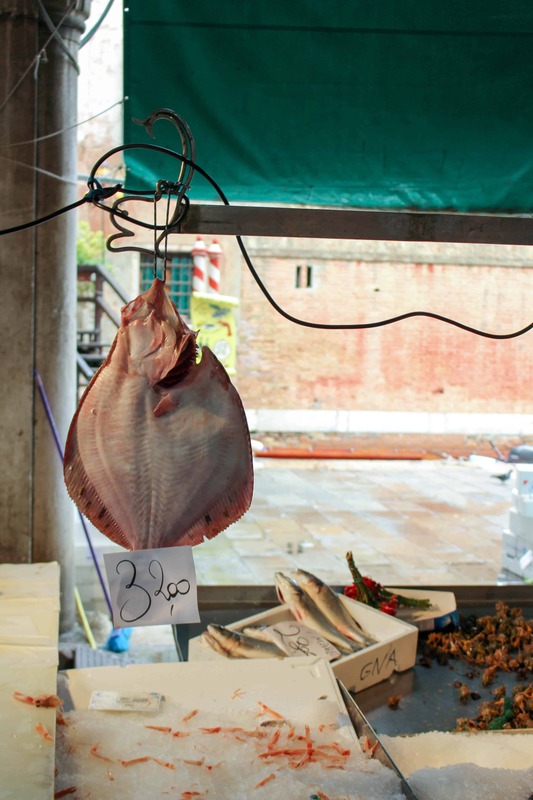 We asked the bartender about an amber colored jiggly mound in the cicchetti case, and he informed us that it’s a local delicacy called “nervetti,” or cow nerves (later we found out it was actually cow tendons). Of course, we had to know what it tasted like, so he kindly offered us a little sample and laughed as we squeamishly dug in. The flavor wasn’t terrible; it was mostly overwhelmed by vinegar and onions. But it was the gelatenous texture that had me gagging. I’m just not down with jellied things. But I’m glad I at least gave it a try? We thanked the nice bartender and moved on to a tiny corner bar called All ‘Adriatico Mar, which opened up to a beautiful dock outside. We ordered more wine from the jolly plump man behind the counter and dangled our feet off the dock as we took in the scene. 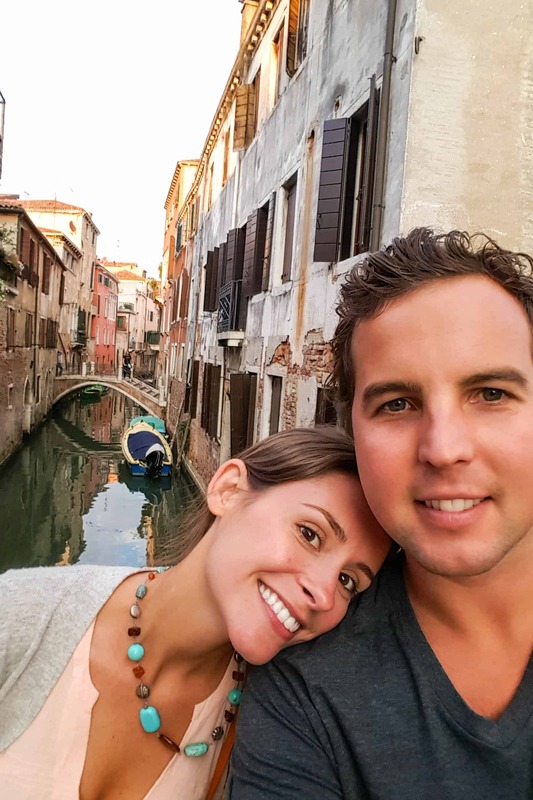 We struck up a conversation with some locals who informed us we were at one of the best spots in all of Venice, and we believed them. We watched a boat drive up soley to have a cigarette lit by one of the patrons before pulling away. It reminded us of the bars back in New Jersey where locals pull right up in their boats and always find someone they know inside. We were the only non-Italians present, but somehow felt right at home. After downing several glasses of wine, we said goodbye to our new friends and headed off to dinner at Ostaria Do Farai, as per their recommendation. We were feeling pretty good at this point, but ordered a bottle of wine with dinner anyway – it was our last night, after all. The owner, who I’m fairly certain was Poseidon himself, greeted us at the table and offered several suggestions, of which we took them all. We started off with an incredibly fresh branzino carpaccio that was expertly carved tableside and dressed with a splash of Prosecco, lots of lemon, salt, pepper and olive oil. 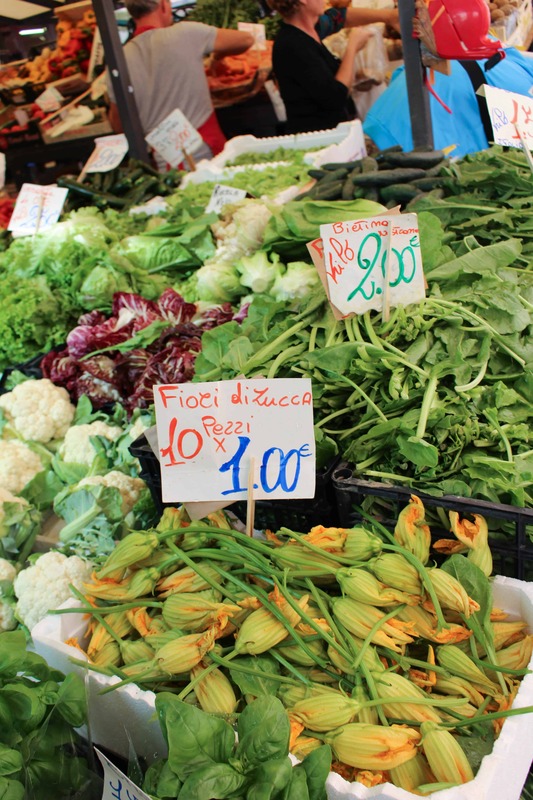 It was the supremely fresh, high-quality simplicity I’d come to adore in this country. 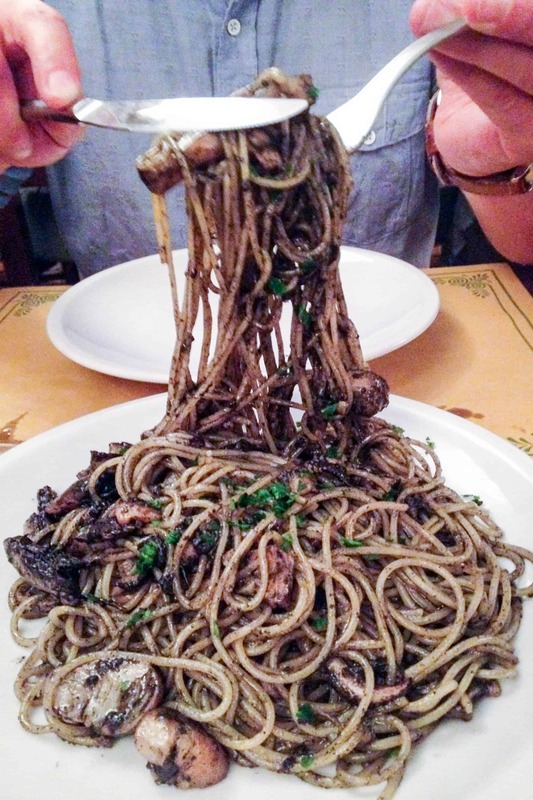 Next, we had fresh pasta tossed with cuttlefish and its jet black ink. It was rich, delicate and tasty enough, but nothing that had me jonesing for seconds. Next, a whole local sea bass, grilled to perfection, filleted at the table and adorned simply with lemon and olive oil. 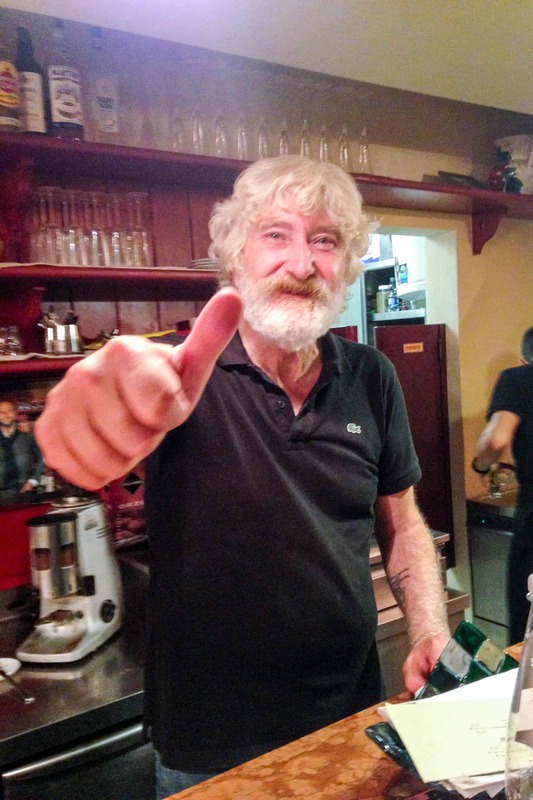 We housed it, then finished the meal with tiramisu, espresso, and a bizarre conversation with the owner where he showed us photographs of Jake Gyllenhaal dining there just a week before us (dang!). We ended the night by sitting on the street overlooking the canal, eating gelato, watching the locals, and reflecting on what had been an unbelievable two weeks of travel. The following day we rode the train into Milan, where we strategically packed our bags and prepared for a grueling day of travel home. 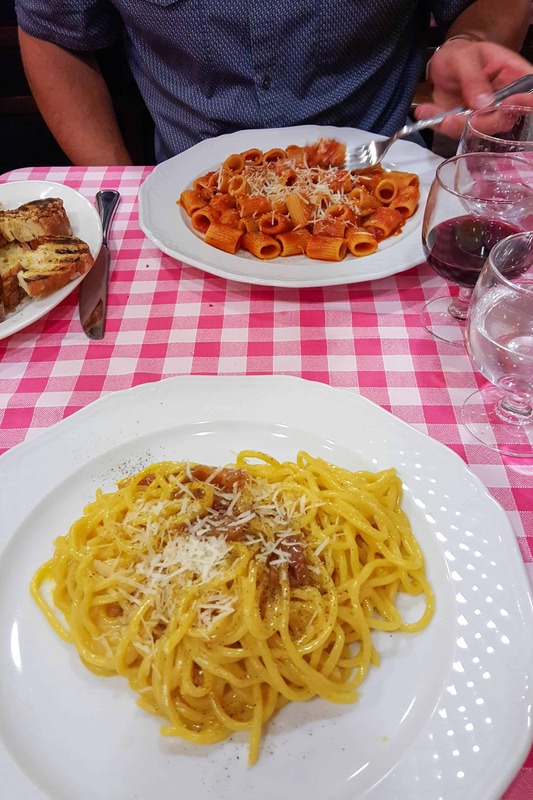 We had our last supper at Da Giannino l’Angolo d’Abruzzo, where we shared a carafe of house red wine, a huge plate of antipasto and two nice pasta dishes including a silky, rich and very memorable carbonara. And so it was time to bid farewell to a country I’d fallen madly in love over two short weeks. I had high expectations going into this trip, and it somehow managed to surpass them all. My Italian wanderlust had finally been satisfied, and there was no doubt we were both leaving with a big, itchy bite from the travel bug (mosquitos too – but thats another story). We managed to see a large part of the country in a relatively short amount of time, but we purposefully left lots of stones unturned so we can come back to experience the discovery and magic all over again. Until next time, Italy. I already miss you. I so appreciated your take on Venice. My sister and I disagree on this since I thought it was pretty much an open sewer with some great views and she thinks that it is heaven with canals. I promise, however, that it is light years more attractive than it was in 1969 and 70 when I first got to visit. Oh, gross. It was literally sinking and stinking at the same time. They have poured billions into it since then and it really is much improved but still not my favorite part of Italy. Somehow it just doesn’t really feel like Italy in many ways. No matter, I have totally enjoyed your commentary and hope that you get to go again soon. Maybe the next time to Sicily? Thanks Bruno! I can’t imagine what Venice must have been like in the 70s. I found it to definitely be one of the dirtier cities I’ve ever visited, with many areas reeking of urine. That being said, I totally fell in love with their cicchetti culture. 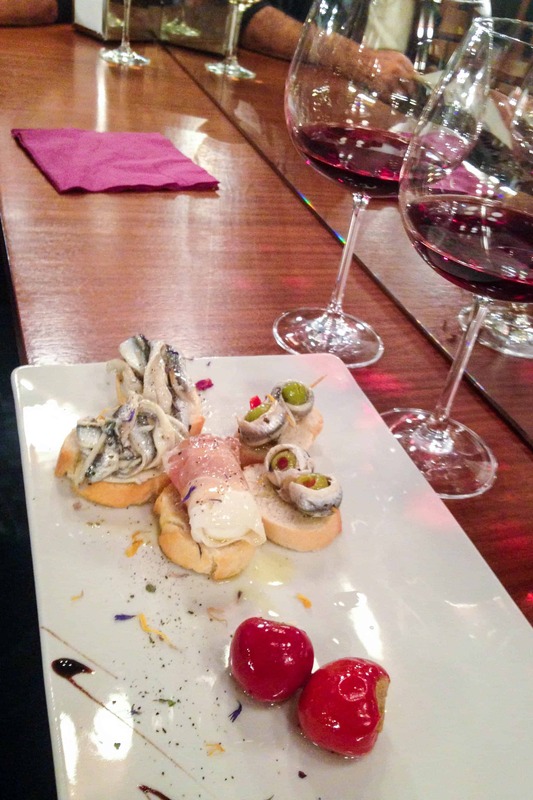 Though rather than making me want to visit Venice again, it made me really want to visit the Basque region of Spain to experience true tapas. That is ranked high up on my list of places to go next. Also, Sicily. I’m just dying to get over there!